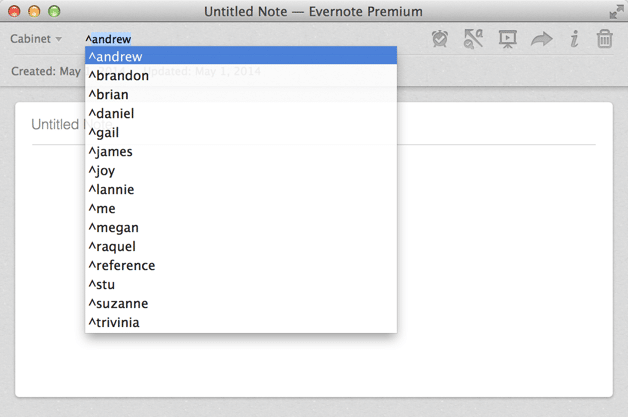 I often refer to Evernote as my digital brain. It has replaced my physical filing cabinet, allowing me to go completely digital. It is where I store anything I need to reference later. But Evernote can quickly become unwieldy if you don’t have a system for using it. It doesn’t have to be complex, but it does have to be intentional. My own strategy has evolved over time. When I started with Evernote, I organized everything with Notebooks. In addition, I used Stacks to create a hierarchy of Notebooks. I documented my structure in a post called, “How to Organize Evernote for Maximum Efficiency.” But since that time, I have radically re-worked my system. A Note can only exist in one Notebook at a time. It’s a one-to-many relationship. The problem comes when you want to include a Note in two or more notebooks. That’s a many-to-many relationship, and it isn’t supported. You have to duplicate the note and put a copy in each notebook. This ends up being more work than it’s worth. Notebooks can be stacked but not nested. In essence, this means you can only create a hierarchy that is one level deep: a stack with a group of Notebooks. My life is more complex than that. I wanted to be able to organize things in multiple levels. Tags are virtually unlimited. You can have up to 100,000 per account. This will satisfy the needs of 99.9% of users, including me. Notes can have multiple Tags. The practical value of this is that a note can exist in multiple containers without duplication. For example, if I meet with Megan about Platform University and my upcoming Get Noticed! Theme launch, I can Tag it with “meeting notes,” “platform university,” and “get noticed! theme.” In this way, I can see this same Note, regardless of the Tag I am using. Tags can be nested into multiple hierarchies. 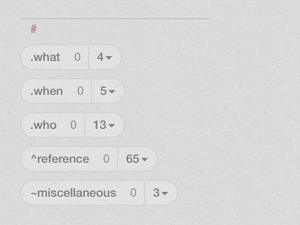 This allows me to organize my Tags in a way that makes sense for me. I am not constrained by the limitations of the software. Inbox—this is where I put Notes I need to process later. It corresponds to a physical inbox. Cabinet —this is where I put Notes I have processed and want to keep. It corresponds to a filing cabinet. Shared —this is a Stack or collection of Notebooks. This is where I keep Notebooks that others have shared with me. Trash —this is where Notes go when you delete them. Until you “empty the trash,” you can restore them to another Notebook. This is dramatically more simple than what I used to use. Next, I nest my Tags to create a hierarchy that reflects how I think about my life and business. Notice that all my Tags are lowercase. This isn’t a big deal, but I like the consistency. These top levels are all collections. They function similar to Stacks. Notice that I begin each tag collection with a special character—a period, a carat, or a tilde. I never actually use these as Tags in my Notes. I simply use them to organize my real Tags. The cool thing is that you can nest these Tag collections as deep as you want to go. By the way, you nest Tags by dragging the ”Child” Tag onto the “Parent” Tag. When you do that, the Child appears under the Parent. For example, under my .what Tag, I have nested four additional collections. Under .work , I have four collections. Under .products , I have a set of collection Tags for each of my main product categories. Notice that under .conferences I have the actual tags that I use with my Notes. These are my actual conferences. In some cases, I might have multiple products with the same name, so I distinguish between conferences, books, speeches, etc. By the way, you can nest these as deep as you want, though I would be careful not to make your system too complex. This is often a matter of trial and error. My .when collection is particularly useful. I use this for information related to past or future events. It might include speaking or consulting engagements, phone appointments, one-on-one meetings, etc. They provide a convenient way to collect all the materials related to that event. 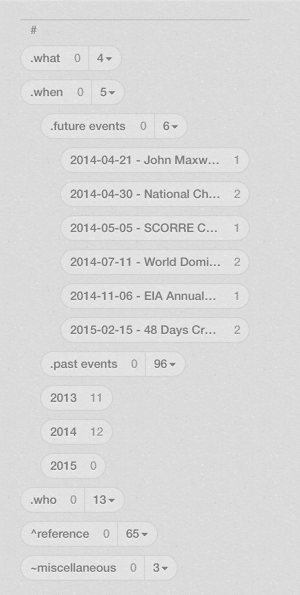 When the event is passed, I drag the Tag to the past events collection. In the .who collection, I have a Tag for each of my teammates. Finally, the ^reference collection contains the kinds of Tags you would include in any filing cabinet. I don’t include them here because some are confidential. By the way, I start with the caret, because it sorts after the collections with periods. !templates—this is where I keep reusable Note templates. For example, I have templates for Pre-Event Calls with Event Sponsors, Book Net Outs (where I summarize the books I read), Packing Lists, just to name a few. 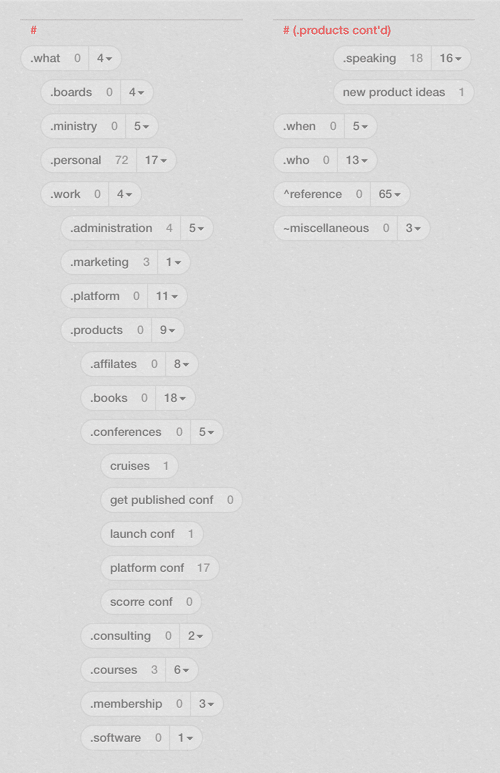 .shared—this is where I store Tags from shared Notebooks. Since I can’t always control the Tags that others use, I simply segregate them here, so they don’t “pollute” my system. read later—rather than use an application like Read Later or Instapaper, I clip blog posts and articles that I want to save for later reading. I can get to all these by simply searching for this Tag. My system is not perfect, but it works for me. It took some work to set up, but now I rarely think about it. I simply add the appropriate Tag to my Notes. I’m sure my system will continue to evolve over time. Hopefully, this gives you a few ideas of how you can design your system. The key is to design a structure that frees your mind from distraction and allows you to focus on what matters most. 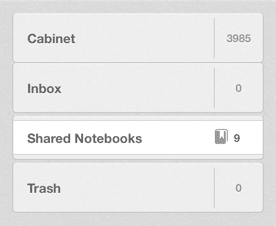 Question: How is your Evernote system organized?